As those of you familiar with SEO know, Google is constantly rolling out new algorithms to keep us SEOers on our toes. The latest algorithm actually occurred September 2016, which makes its name even more fitting: Possum. Despite the fact that most digital marketing managers weren’t even aware that Google had released the Possum, the algorithm was so cleverly named by a group of marketers who got a kick out business owners’ confusion. You see, this newest algorithm hid Google My Business listings, or, rather, filtered them. While many business owners thought that their listings were just gone, they weren’t; they were just playing Possum. But what is Possum, and what does it mean for business owners? As far as most marketers are aware, Possum only really affected the Local search results. Evidence indicates that Google rolled out the update in order to keep spam listings out of local search results, and to diversify the local listings. This is huge for small businesses everywhere that have constantly been pushed to the bottom of the results page thanks to big businesses with bigger marketing spend, and who want to know how to get on Google Maps results fair and square. Have you noticed that when you type in “food near me” on your mobile device, the Google Maps search results constantly change the more you move? This is thanks to Possum, which has made it so that a user’s location alters the results that pop up. As a user moves, the results change; this is even the case if the user moves North a block, or heads South a mile. The algorithm utilizes a mobile device’s GPS location and a desktop computer’s IP address location in order to determine distance. Google used to deliver results for keywords and keyword phrases that were similar to what the user typed in, but Possum has made it so that keyword variation is important, and what you type in is what you get. For instance, a search query of “Thai restaurants Hartford,” “Hartford Thai restaurants” and “Thai restaurants in Hartford, CT” would have turned up the same results, without the search engines ever taking into consideration the keyword variant. Thanks to Possum, however, if a business wants to rank for a particular search term, it has to be optimized for that exact term or phrase. Many believe Google did this because Local search has become so competitive, and this was meant to level the playing field. If a company wants to rank for a certain term, they best make damn sure that that term shows up on their site. The main purpose for Google’s algorithm changes is to keep people from manipulating the search results. They first did this by weeding out listings that shared a URL or phone number, but Possum has taken that screen to the next level and now filters out businesses that share the same location. The results have been two-fold. On the one hand, such a filter is great for users as it eliminates companies that were manipulating the system by claiming multiple locations in order to have multiple listings in the Local search results. On the other hand, it’s a bummer for businesses that actually share a location, such as medical offices, dental offices and law firms. These businesses will only be listed once, as Google wants to eliminate any chances of redundancy. Prior to Possum, any business that was located outside of the city limits didn’t pop up for local searches. This was true even for businesses directly outside of city limits. However, now businesses that were in “ranking purgatory” have seen a spike in their rankings, with some even positioned in the top three spots. This is in small part thanks to the Keyword Variation changes mentioned in point 2, and in large part due to the way Google now determines City Limits. Now, instead of Google giving more weight to the location the user types in, they provide results based on a user’s actual location and their search query, which is beneficial for those businesses that were in search limbo and users, who can now view all of their options online before making a decision of where to shop/eat/invest. With the introduction of Possum came two distinctive search algorithms: one for Local Map results and one for organic listings (Google.com). Before Possum, if the URL listed on your Google My Business page wasn’t listed in the organic search results, you wouldn’t rank—or, if you did rank, you wouldn’t rank well. This was because Google assumed that you were trying to manipulate the system by creating duplicate websites, which didn’t bode well for businesses that are in the practice of including their site and information on local listing pages, as most businesses are. Since the update, Google recognizes that Google My Business pages as their own separate entities and therefore does not penalize companies with a local listing and their own website; in fact, many businesses that utilize the local listings and a website have been noticing a rise in their rankings. Many believe this is because Google no longer treats Local and Organic search the same, but instead, have made the local filter and organic filter run separately from one another. 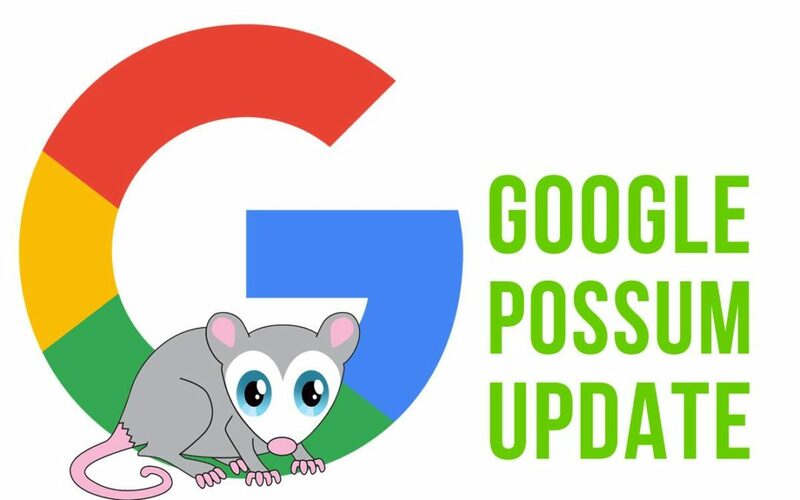 As with all of Google’s algorithm changes, the Possum was released more for the benefit of users and therefore, for the benefit of Google itself, while us businesses are forced to revise our SEO strategies yet again. We’re not complaining, as it gives those with the knowledge, skillset and motivation to do better a competitive edge in Local search.